Clinical staff who give parenteral medications should have regular updates in dealing with anaphylactic reactions. The Health Protection Agency recommends that staff who give immunisations should have annual updates in anaphylaxis. Clinical staff should be familiar with the equipment and drugs they have available and should check them regularly. Adrenaline must be readily available in clinical areas where anaphylaxis could occur. The aim of the initial treatment is to keep the patient alive, and achieve some clinical improvement. This will buy time for further treatment and expert help. This learning resource has been written to meet the needs of a wide variety of health care professionals such as health care support workers, registered practitioners and medical staff in both the community and hospital setting. If you already have an account with e-LfH, then you can enrol on to the WM – Anaphylaxis programme by logging in to the e-LfH Hub, selecting My Account > Enrolment and selecting the programme. You can then access the programme immediately in the My e-Learning section. 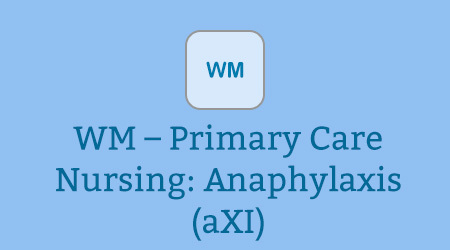 The West Midlands Anaphylaxis programme is also available to NHS healthcare staff via the Electronic Staff Record (ESR). Accessing this e-Learning via ESR means that your completions will transfer with you throughout your NHS career. If your organisation is outside the West Midlands, please contact Support.Learning@wm.hee.nhs.uk to arrange ESR access.